Today was a big day for Sam! 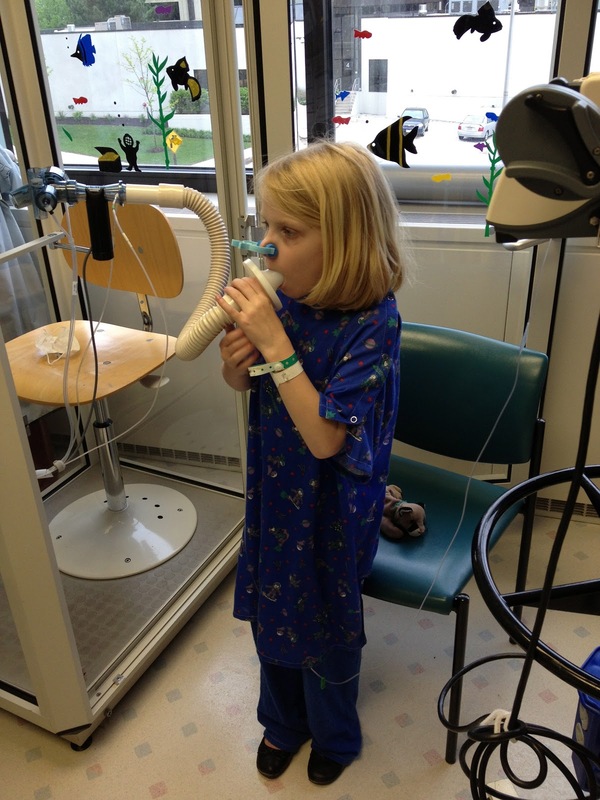 In order to go home, she needed her Pulmonary Function Tests (PFTs) to be back to normal. To show you the process, I'll give you a brief historical rundown of her status with these PFTs. So, as you can see, she was in a pretty bad way when she first got checked in. Basically, and this is only basically, she was only getting half of her lung power. So we've climbed up quite a bit since then. Unfortunately, there is still quite a bit to go. There is a chance...however small...that Sam will go home on Friday!!! Ok, back to reality. Thursday will determine a lot. If her next PFTs are good, then she will probably get to go home. However, if they aren't close to her baseline, then she won't be cleared. For the last few weeks, we've been working off of a theory of an asthmatic exacerbation that triggered a Cystic Fibrosis exacerbation. It's been a very challenging time as these two have magnified each other's symptoms and made it more complicated to get any of it under control. After seeing little to no improvement, Sam's attending doctor performed a bronchoscopy. Those culture results have come back and Samantha has tested positive for a fungus called Aspergillus. It can grow in healthy lungs, but for some people with Cystic Fibrosis (and asthmatics) it can cause an extreme allergic reaction. That reaction is called Allergic Bronchopulmonary Aspergillosis. Thankfully, as with most medical issues, it has an acronym: ABPA. The official diagnosis will be based on a detailed blood test, but Sam's doctors have started her on treatment for it believing the blood test will come back positive. We've briefly been told about the treatment plan which includes 1-3 months of tapered down steroids, anti-fungal meds, and then injections every 2-3 weeks. Mom is trying not to think about this yet. But how did a fungus that healthy people have turn into a hospital stay for Sam? First, the fungus grew. We don't know how it happened, but since it grows in decaying matter, I figure Sam picked it up while playing down at the local brook that runs through our neighborhood. Second, her cystic-fibrosis-infected lungs reacted (this is the ABPA) by secreting more mucus. In a normal body, that mucus would carry the fungus out. Third, because cystic fibrosis patients have thicker mucus secretions than normal lungs, it eventually collapsed several lung lobes and led to the exacerbation. This leads back to the PFTs. When lungs are blocked, PFTs are bad. Now that we're clearing out her lungs and treating the cause, and it's just a little slower process to get back to baseline than it normally would be. Wow! So much going on in that little body! 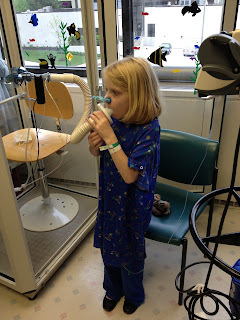 Thank you for keeping us updated and, in the process, teaching me a bit more about CF. My prayers are with you all constantly. You are ALL an inspiration with the way you are each handling this situation with faith and grace. Love to you all and big hugs! Thank you Demi! You are in our thoughts often as well! I am not sure whether or not you have heard about Kalydeco. But is is very expensive drug and have to be consumed continually.